What Are Some Common Addictions Among Asian American/Pacific Islanders? Are There Differences in Substance Use Among Subgroups? Why Do People in This Group Abuse Drugs and Alcohol? What Are Some Barriers to Treatment in This Population? What Other Issues Does This Group Need Help With in Treatment? Where Can This Population Get Help? 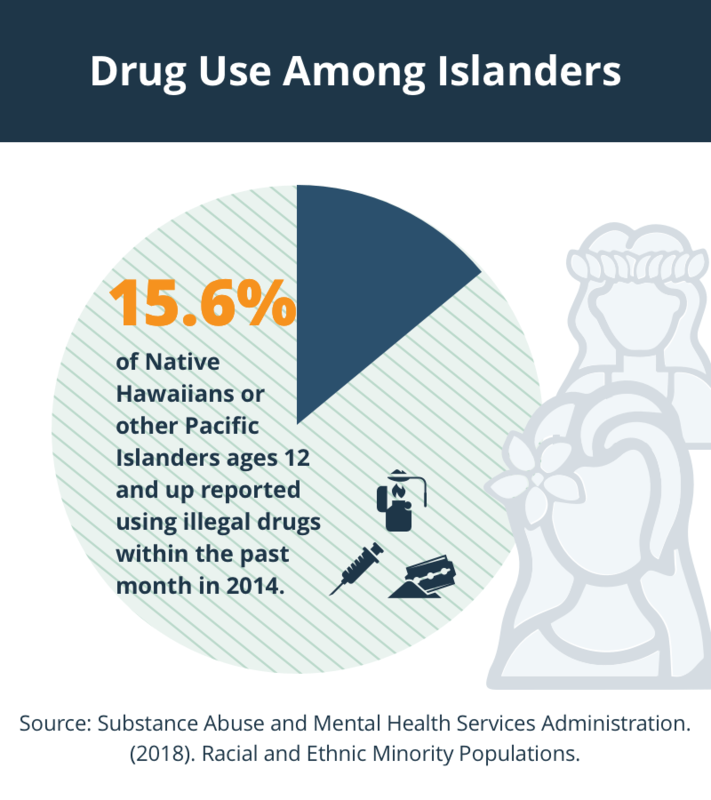 Asian Americans and Pacific Islanders generally have lower rates of substance use disorders than other cultural groups, which has contributed to a stereotype of them as a “model minority.”2 This view discounts the impact these problems have on the community. 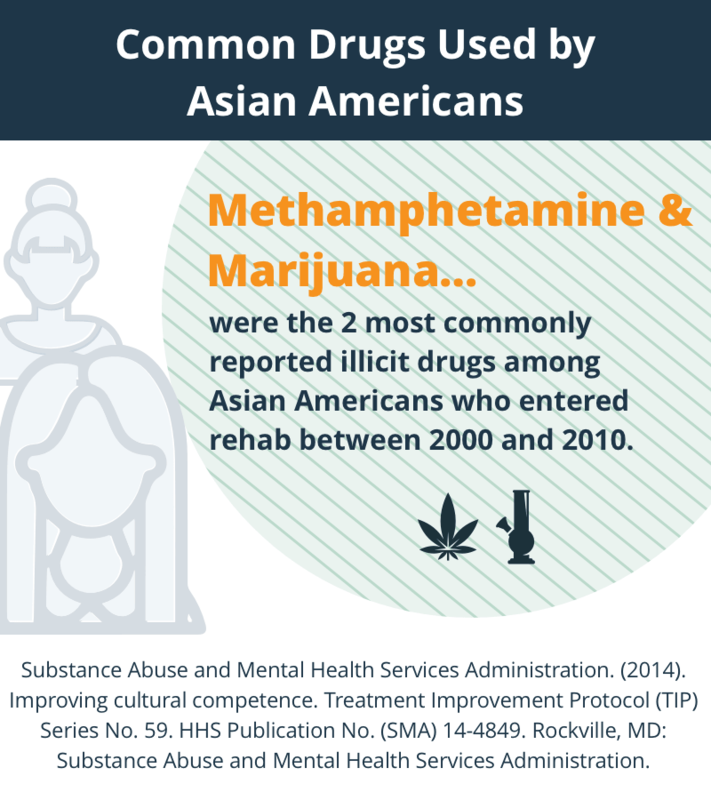 Asian Americans are also less likely than other cultural groups to seek help when they have a problem.1 They may feel ashamed about having an addiction or not have access to culturally competent treatment providers. They may benefit from understanding their unique risks and how they can find an affordable treatment program. Methamphetamine. Although Asian Americans tend to have lower rates of cocaine and heroin use, some subgroups show alarming rates of methamphetamine use.2 Meth was one of the most commonly reported illicit drugs among people in this group who entered addiction treatment between 2000 and 2010.1 This drug is especially problematic among Asian Americans in Hawaii and on the West Coast, where it is more available. Korean American college students drink greater amounts of alcohol than Chinese American college students and are more likely to view drinking as socially acceptable. They are also more likely to have family histories of alcoholism. Vietnamese Americans have higher rates of alcohol use than other Southeast Asian Americans, while Cambodian Americans have higher rates of illicit drug use. Filipino Americans are at higher risk of using and injecting illicit drugs compared to other Asian Americans. Compared to Chinese Americans, Filipino Americans are more than two times as likely to be diagnosed with a substance use disorder. Japanese American adolescents have higher rates of alcohol, marijuana, inhalant, and other illicit drug use compared to Vietnamese, Chinese, Korean, and Filipino Americans. Mixed-heritage Chinese and Vietnamese Americans, meaning people whose families originate from more than one cultural group, are up to four times more likely to use drugs and alcohol compared to non-mixed-heritage Chinese and Vietnamese Americans. History of trauma. Asian Americans may have been exposed to multiple traumas in their countries of origin, including war, torture, and death of or separation from loved ones.1,5 Moving from a person’s homeland to the United States can also be traumatic. Trauma can lead to posttraumatic stress disorder, a condition that involves intrusive memories, nightmares, and flashbacks to a traumatic event.3 Asian Americans who have suffered traumatic experiences may use drugs and alcohol to cope. Intergenerational tension. Asian American family members may differ in their levels of acculturation.1,6 For example, older generations may hold onto customs and traditions, while younger generations may try to adopt the customs and traditions of the new culture. The older and younger generations may clash, causing tension and distress. Asian American youth may also feel that their parents are putting pressure on them to meet high academic standards, and this increased stress may contribute to substance use. Separation from family members. Parents play an important role when it comes to whether or not their children will experiment with drugs and alcohol. Asian American youth whose parents disapprove of drug and alcohol use and communicate these concerns are less likely to use drugs and alcohol.4 Children who are separated from their parents due to immigration, trauma, or divorce may be at risk for substance use. Using a drug in larger amounts or more frequently over time. Unsuccessfully trying to cut back on drug use. Spending a great deal of time seeking, using, or recovering from a drug. Having cravings to use more of a drug. Being unable to take care of responsibilities at home, work, or school because of drug use. Continuing to use a drug despite physical or mental health problems caused or made worse by drug use. Tolerance, a condition that involves a need for more of a drug to get the same effects. Withdrawal, a condition that involves physical and mental symptoms that develop when stopping or reducing drug use. Asian Americans addicted to drugs and alcohol face barriers to treatment that may prevent them from getting the help that they need. Without the proper help, their addictions may become more severe over time. Language. Asian Americans may avoid seeking treatment if services are not available in their language.7 They may be more likely to seek help when bilingual services are available. Lack of awareness of the signs and symptoms of addiction. 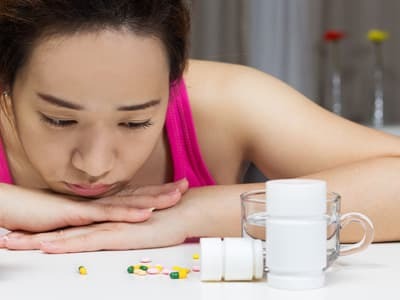 Asian Americans may be unsure of the signs of addiction or experience them as physical symptoms.2 They may seek medical help, rather than addiction treatment. Lack of services. In some cases, treatment that meets a person’s needs is simply not available.2 This can include treatment that is local, affordable, and accessible. Asian Americans who recently immigrated, do not have health insurance, and do not speak English may have an especially hard time finding help. Lack of culturally competent providers. 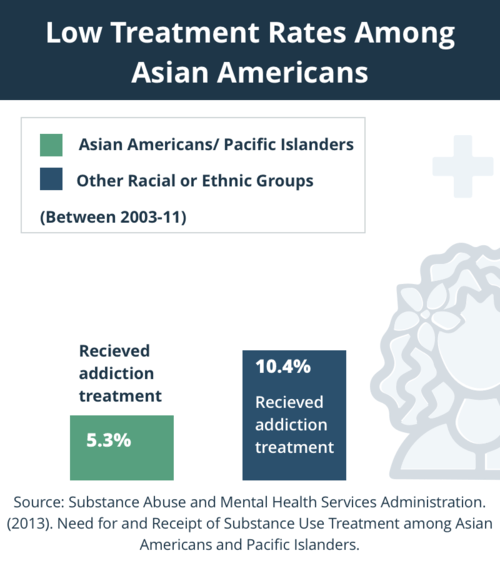 Many providers may be unfamiliar with Asian Americans’ beliefs, values, and views on addiction.2 Also, available treatment programs may not offer approaches that are effective at treating Asian Americans. As a result, Asian Americans may feel more comfortable seeking help from family and friends or using non-Western approaches, such as Chinese herbal medicine or religious healers. Employment services. For people who recently immigrated to the United States, finding a job that matches their skill set may be difficult. Asian Americans may benefit from job training and assistance finding a job. Citizenship assistance. Asian Americans may benefit from information and assistance on how to become a legal resident or citizen. Help for families. The stress of acculturation combined with having a family member suffer from addiction can put strain on families. For many Asian Americans, involving family members in treatment can improve the chances of a successful recovery.1 Family members may participate in family therapy, educational groups on addiction, and recovery meetings for family members of people addicted to drugs and alcohol, such as Al-Anon and Nar-Anon. Medical treatment. Users may need treatment for physical health issues that may arise from drug and alcohol abuse, such as liver disease, hepatitis, and infections. Mental health treatment. Asian Americans seeking addiction treatment may also suffer from psychiatric problems related to immigration and acculturation, family tension, past trauma, and other issues. Co-occurring treatment provides help for both addiction problems and mental illness. Government-funded treatment programs may cost less than private programs. Detoxification allows people to withdraw from drugs and alcohol in a safe and controlled environment. Detoxification centers are staffed with medical professionals who closely monitor symptoms and provide treatment and support to reduce the likelihood of a dangerous withdrawal. Inpatient treatment programs offer help and support 24 hours per day for people in the early stages of recovery. These programs provide drug-free housing and intensive therapy sessions. Some programs also offer recovery meetings, such as Alcoholics Anonymous, and other amenities, such as yoga, exercise, and equine therapy. Outpatient treatment programs offer one or more group and individual therapy sessions each week. They are less intensive than inpatient programs, since they do not include drug-free housing and 24-hour help. They are a helpful option for people who have completed an inpatient treatment program and would like to continue to receive support. Government-funded treatment programs may cost less than private programs. These programs may offer detox, inpatient, and outpatient treatment for little or no cost. Nonprofit treatment programs also offer free or lower-cost treatment for people who cannot afford private programs. The Salvation Army Harbor Light Centers offer a six-month program that includes detox, residential, and outpatient treatment, along with therapy, education, anger and grief management, housing, and job training. Catholic Charities is a nonprofit agency with over 160 locations throughout the United States. Local agencies offer addiction counseling and help with relapse prevention. Twelve-step programs incorporate the principles and philosophy of Alcoholics Anonymous (AA) into treatment. AA helps members recover by encouraging them to recognize their powerlessness over their addiction, develop a connection with a higher power, make amends for past wrongs, and develop a support system of other sober people. Many inpatient and outpatient, private, government-funded, and nonprofit treatment programs offer 12-step treatment. How Do You Find a Culturally Competent Program? Does your program work with individuals from my cultural background? How will your program incorporate cultural competence into my treatment? What kind of training does your staff receive on cultural competence? 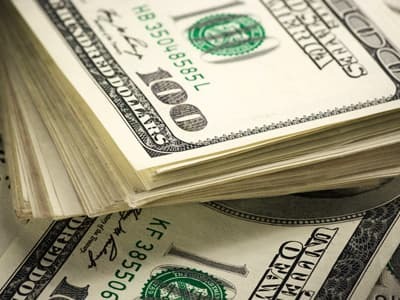 The cost of addiction treatment can range significantly from program to program. Many people do not get the proper help for their addictions because they assume that they cannot afford it. Fortunately, there are several options to help reduce the costs of addiction treatment. The Substance Abuse and Mental Health Services Administration’s (SAMHSA) Behavioral Health Treatment Services Locator offers an online search tool for finding free and low-cost treatment programs in your area. You can also find a program by calling SAMHSA’s National Helpline at 1-800-662-HELP (4357). 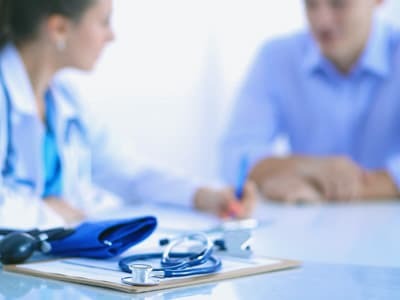 Health insurance can help cover all or some of the costs of treatment. If you do not have health insurance, you can sign up through the Affordable Care Act by going to the Healthcare.gov website. You may sign up anytime during the open enrollment period. If it is outside of the enrollment period, you may still qualify if you have experienced certain life events. You can find out whether you are eligible for coverage by entering your zip code and answering some questions on the government’s public health insurance website. Treatment centers may use a sliding scale to lower the fee for treatment. Sliding scales consider a person’s annual household income and household size to determine an affordable fee. Payment programs allow you to pay for treatment over an extended period of time, rather than all at once. Rehab scholarships can cover all or some of the costs for people who cannot afford treatment and are highly motivated. The Asian Community Mental Health Services (ACMHS) is a California-based organization that conducts research and provides education and culturally competent treatment in several different languages. It seeks to help members of the Asian American and Pacific Island communities to lead healthy and productive lives. The Asian Counseling and Referral Services (ACRS) is a Seattle-based organization that provides free and low-cost mental health and addiction treatment, citizenship and immigration assistance, and job training for Asian American children, teens, adults, and older adults. The National Asian Pacific American Families Against Substance Abuse (NAPAFASA) is a nonprofit organization that seeks to prevent and reduce drug, alcohol, tobacco, and gambling addiction among the Asian American community. Through research, advocacy, and education, the NAPAFASA promotes health and social justice. The National Alliance on Mental Illness (NAMI) offers education on living with mental illness, discussion groups, and information on finding a culturally competent provider. NAMI also offers face-to-face meetings for individuals and family members of loved ones suffering from mental illness across the United States. You can contact NAMI’s helpline at 1-800-950-NAMI (6264). The Asian American Health Initiative offers a pamphlet, “Mental Health: Understanding is the First Step,” which explains the signs and symptoms of mental illness among Asian Americans, types of mental health providers, and how to get help. Fong, T. W., & Tsuang, J. (2007). Asian-Americans, addictions, and barriers to treatment. Psychiatry (Edgmont), 4(11), 51-59. Hong, J. S., Huang, H., Sabri, B., & Kim, J. S. (2011). 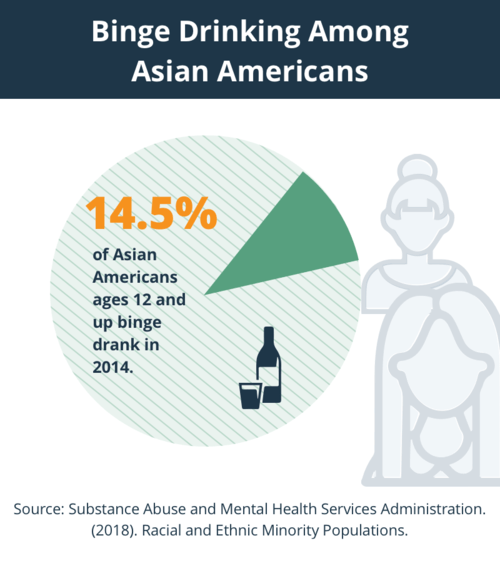 Substance abuse among Asian American youth: An ecological review of the literature. Children and Youth Services Review, 33(5), 669-677. Price, R. K., Risk, N. K., Wong, M. M., & Klingle, R. S. (2002). Substance use and abuse by Asian Americans and Pacific Islanders: Preliminary results from four national epidemiologic studies. Public Health Reports, 117(Suppl 1), S39-S50. Hahm, H. C., Lahiff, M., & Guterman, N. B. (2003). Acculturation and parental attachment in Asian-American adolescents’ alcohol use. Journal of Adolescent Health, 33(2), 119-129. Yu, J., Clark, L. P., Chandra, L., Dias, A., & Lai, T. F. M. (2009). Reducing cultural barriers to substance abuse treatment among Asian Americans: A case study in New York City. Journal of Substance Abuse Treatment, 37(4), 398-406. National Asian Pacific American Families Against Substance Abuse. (2005). Fact Sheet: Asian American and Pacific Islander (AAPI) Alcohol Use.